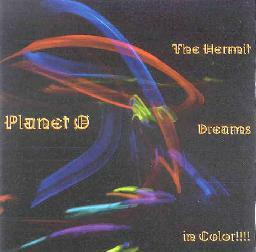 Planet 0 - "The Hermit Dream In Color!!!!" / "A Ragged Silhouette Against The Clouds"
Memphis, Tennessee space-meisters Planet 0 follow-up their 2001 debut, Set The Controls For Planet None (see AI #15), with two more CD's of all instrumental Space Rock. The band is still the quintet of Roger Moneymaker on guitar, Robert Hinson on bass, Richard McCracken on drums, Chris "Mental Anguish" Phinney and Carl "Nomuzic" Howard on all manner of electronic and noise making devices and human produced sounds. The Hermit Dream in Color!!!! is loaded with freeform jams that stretch out between 8-13 minutes. The first several tracks have a strong 70's influence, which sounds very cool combined with the spaced out alien elements. "Caution: Elephant Crossing" begins with eerie atmospherics and voice samples, though things quickly soar into space as a banquet of electronics start to swirl. Then a rocking drum beat kicks in and the rhythm section launch into a steady grooving jam. It's a nice rockin' 70's styled jam tune, but taken into another dimension by the ultra spaced out electronics. "The Descension Down The Rabbit Hole" is a slow space drone tune that's once again based in a 70's jam styled. Very tasteful guitar leads from Moneymaker. I really like the melodic ethereal guitar sound on this tune, and combined with the hyper-kinetic electronics makes for a wild contrast. 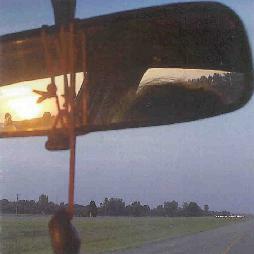 "Moonbeams, Satellites And Shooting Stars" is similar but with nice Bluesy melodic guitar leads. Space Blues.... yeah! But there are also sections that bring to mind a spaced out version of Derek and the Dominoes. Very cool. With "The Minds Eye Sees Porkpie" we start to explore somewhat different territory, the song having a rockin' vibe that reminds me of Pressurehed - probably due to Hinson's bass - but the rest is all Planet 0 freeform jamming, and the song really develops into a very tasty groove rocker. "The Hermit Dreams In Color" is a standout track, featuring simple but gorgeous guitar lines combined with space electronics that are very much in sync with the guitar and rhythmic pulse. "Home Is A Crushed Glass Eye" gets into space-prog territory, the bass and drums creating an edge-of-your-seat intensity while the electronics do their sound exploratory magic. We're also treated to some of Moneymaker and Hinson's most fiery work of the set, with Hinson's bass in particular forming the backbone of the tune. One of my favorite tracks of the set. Finally, "Crown Of Deception" is a quickie 2 minute space blitz that leads into the closing track, "Of Prophets And Golddust", which starts with a drugged droning jam that has more of the 70's rock stylings heard on the first few tracks, but includes tripped out alien sound textures and some thunderous vibrations that shook my brain. But it's also got a kind of proggy feel as it transitions through multiple themes that create a narrative flow. A great closing track to a very nice set. A Ragged Silhouette Against The Clouds features 8 more tracks of lengthy space jams, much of which bears the Planet 0 sound while exploring different realms. "Mesmerized By The Spectacle Of Destruction" opens with Frippoid guitar-scapes, bleeping synths and howling atmospherics, that really gel once the rhythm section kicks in. I like the way the guitar evolves from a vibrating ethereal sound (remember the Twin Peaks theme?) to a passionate Blues style, which sounds lovely enveloped in the space atmospherics and UFO synth fun. Lots of variety here that comes together very nicely. For real rockin' action, "A Tinge Of Red On The Horizon" is a SMOKER of a tune, featuring ripping guitar and high intensity heavy rock, all within a kind of avant-space rock stew. Dig it! "Life At The Top Of The Slope" is a steady paced rocker with a bit of a whimsical feel at the beginning. It takes a while to get going but about halfway through the intensity level climbs and the band settle into a coherent theme. Excellent guitar work on this one, combining cool sounds with tasty leads. Ditto for the bass which sent potent pulsations between my cranium and chest cavity. "A Rain Of Cold Blood Part 1" takes the band into powerful Stoner-Psych territory. Imagine deep-in-space instrumental Black Sabbath. This is one for my Atomic Bongload radio show. Part 2 comes later in the set but is equally stoned, though more in psychedelic garage rock mode than Sabbath. At over 16 minutes, "An Odd Atmosphere About The Place" is the longest track on either of these CD's, and is a totally spaced out psychedelic heavy rock jam. Just dig those bubbling and whining guitar notes and cosmic atmospherics. Mmmmmmm.... yummy!! Another highlight is "Several Veils Of Blue Grey Smoke". Oooooh.... funky! Kind of like a blend of Ash Ra Tempel's more rock oriented moments and the Grateful Dead (Carl will send DEATH my way from Heath for that analogy!!) But it's completely spaced of course. And each musician is off in their own individual realm, though playing as a cohesive whole. A nice free-wheeling jam and I like the trippy feel good vibe of the music. But Planet 0 also get into prog mode too - raw as it is - with a cool orchestral mellotron sounding section. Finally, "A Ragged Silhouette Against The Clouds" is a nice easy paced spacey, melodic closing track. Overall, two excellent sets of freeform, jamming space rock.